You are currently browsing the archives for the tag 'María Félix'. 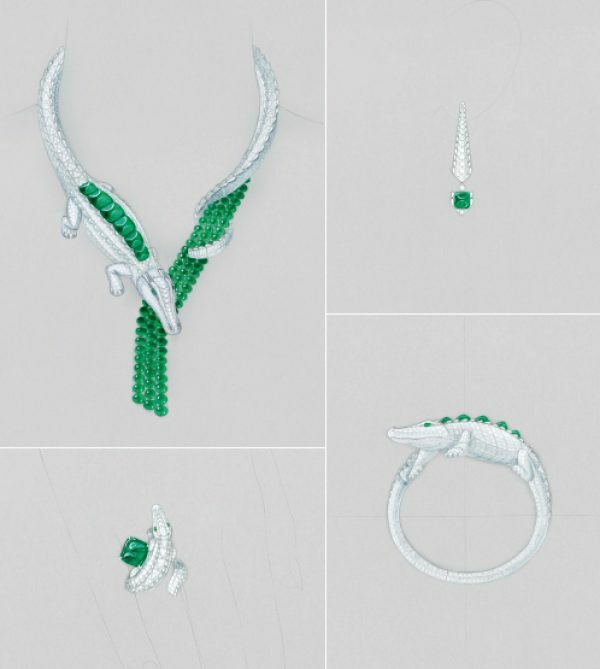 CARTIER HAS CREATED AN EXCEPTIONAL HIGH JEWELLERY PARURE COMPOSED OF A RARE ENSEMBLE OF 14 EMERALDS FROM COLOMBIA. 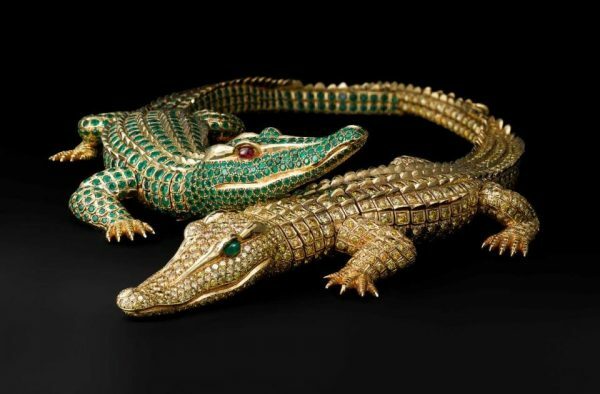 In 1975, Cartier created a necklace for the Mexican actress María Félix that went down in history: two fully articulated crocodiles, one paved with emeralds and the other with yellow diamonds. 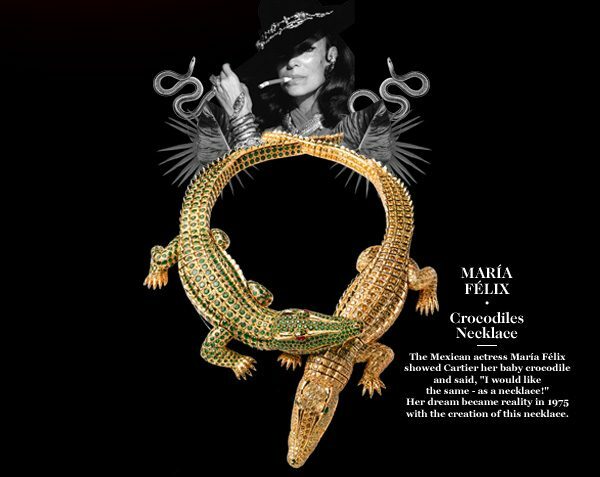 The original crocodile necklace created for María Félix in 1975. The same artisan sculptor behind this historic design was involved in the creation of the new jewellery set. Based around 14 cabochon-cut emeralds from Colombia totalling 46.45 carats, these exceptional gems feature remarkable consistency in terms of quality, colour and shape and are further enhanced by a series of emerald beads in the same intense shade of green. 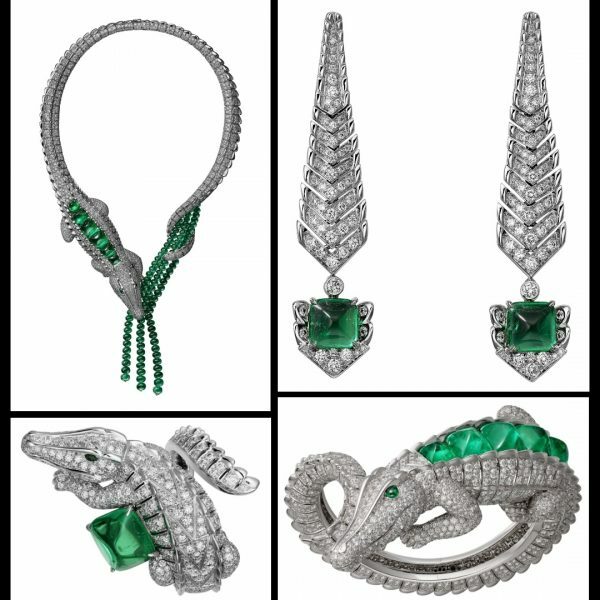 Cartier High Jewellery necklace (H7000289), bracelet (H6023516), ring (H4345200), earrings (H8000448), white gold, diamonds, emeralds. THIS CREATION PAYS TRIBUTE TO THE LEGENDARY NECKLACE ORDERED BY MARÍA FÉLIX. This strikingly realistic reptile, with a powerful body, legs that are ready to move, and an emerald gaze, is distinguished by its protective yet predatory attitude. The design of the four pieces which make up this collection is true to Cartier’s tradition of naturalism: with a single feature, the ridges on the reptile’s back. Stretching out towards the tail, the pieces can be wrapped around the neck, the wrist or the finger, or be suspended as a pair of pendant earrings. The animal’s legs, like its scales, have been specially designed to feel comfortable against the skin. Through the design and lines, the jewellery artisans have created a dynamic, lively shape that demonstrates their unique expertise. 1,875 HOURS OF WORK WERE REQUIRED TO CRAFT THE NECKLACE, AND 1,019 FOR THE BRACELET. A nod to a legendary Cartier necklace that today has been presented around the world through the Cartier Collection’s exhibitions, this necklace perpetuates the long tradition of High Jewellery at Cartier based on one of its iconic themes, its menagerie, in a stunning exercise in craftsmanship and style.